I've been working on a Morkanaut as my latest painting project. I've enjoyed working on this figure despite the fact that I despise most of the current Ork vehicle range. Most of their models, the Trukk in particular, just have too much detail and look like a horrible conversion. One could argue that it's a fluff-based aesthetic, but at the end of the day it just looks like a plastic mess. In contrast, the Morkanaut is a fresh departure from this. The flat, plain plating on most of the figure allow the detailed components such as the claw or the face to draw the viewer's eye. I started by basecoating the Morkanaut with an airbrushed layer of Eshin Grey, followed up by Dawnstone Grey on the raised areas that would catch more light. Next, I gradually added more and more White Scar to the mix while only applying those coats to the most raised and exposed areas. Big models such as this one are great for practicing your airbrush skills. The red areas were started with a basecoat of Rhinox Hide, with a generous application of stippled Khorne Red. Once the Khorne Red was thoroughly dried, I stippled on a coat of Evil Sunz Scarlett. Finally, the red areas were highlighted with a thin application of Wild Rider Red. I painted the rusted areas simply by stippling Ryza Rust over a basecoat of Rhinox Hide. I then stippled some Iron breaker over that and then brought it all together with a Nuln Oil wash. 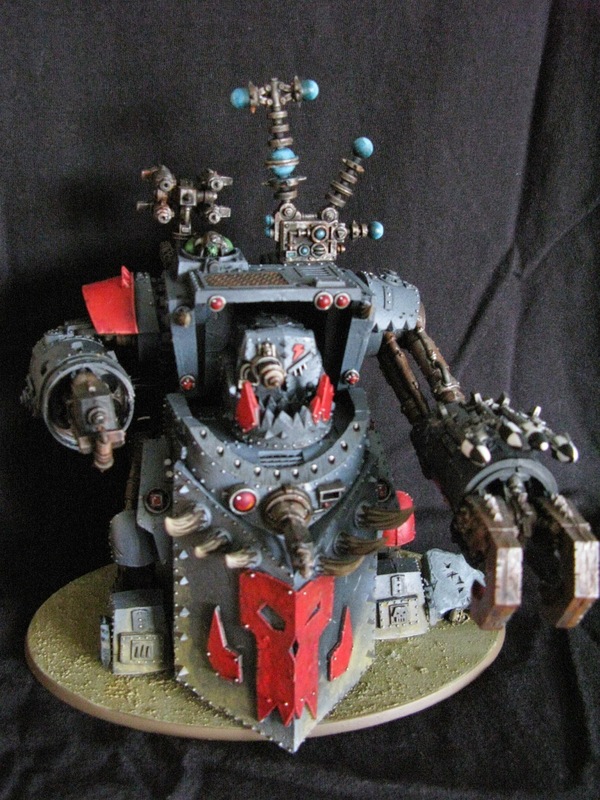 The Morkanaut in all of its Morkiness. The writing beneath the pig reads, "Bad Hog". 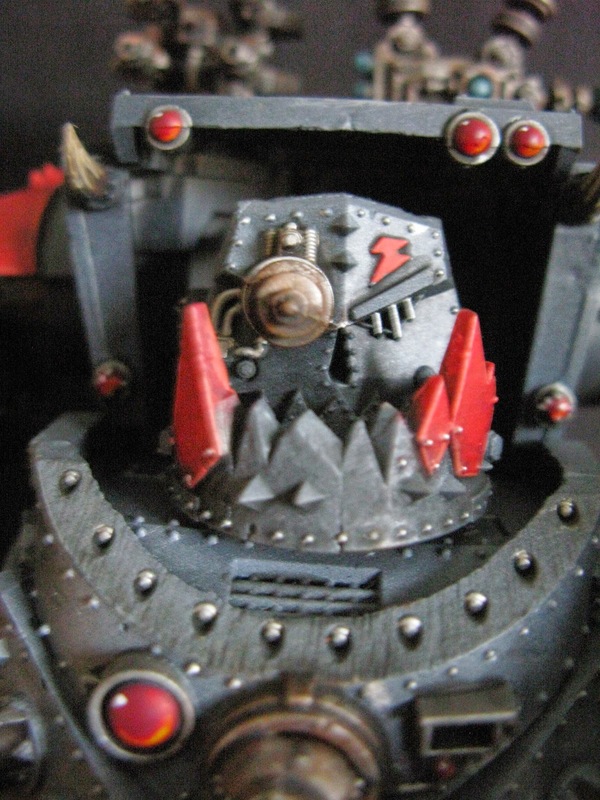 I really liked the idea of the Orks having custom images on their vehicles, sort of like aircraft nose-art or detail work on motorcycles. I think it adds more character to them than the usual glyphs.